"Jo Waada Kiya Woh Nibhaana Padega"
“Jo Waada Kiya Woh Nibhaana Padega, Roke Zamaana Chaahe Roke Khudaayee, Tumako Aana Padega” (What has been promised in the matters of the heart ought to be honoured . . . You will have to come to meet me) a lovely number from the movie “Taj Mahal” (1963 release) has been soothing the ears of the music lover’s even today post five decades of its release. This song of everlasting romance became so popular then and is even today that it fetched the renowned Urdu poet, songwriter and Hindi lyricist Sahir Ludhianvi his first Filmfare Award as the “Best Lyricist”. 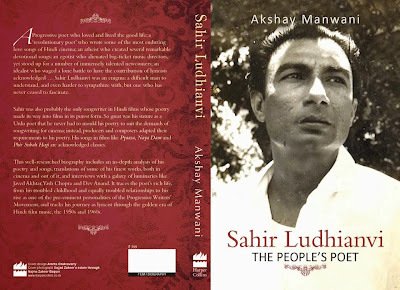 The newly released book Sahir Ludhianvi: The People’s Poet by Akshay Manwani HarperCollins Publication is an exhaustive biography that traces the poet’s rich life from his troubled childhood and his equally troubled love relationships and then his rise as one of the pre-eminent personalities of the Progressive Writers Movement and as a lyricist through the golden era of Hindi film music. Author Akshay Manwani turned to freelance writing after a brief career in the corporate world. His writings on popular Indian culture have appeared in The Caravan, Business Standard, Man's World and Mumbai Mirror. His attempt to profile the life and work of Sahir Ludhianvi stems from the belief that much needs to be done to preserve the legacy of unsung legends. It is also his way of saying thank you to the poet-lyricist who gave him immeasurable joy through his songs. Akshay lives in Mumbai with his wife and daughter. Born on 8th March (International Women's Day) Sahir Ludhianvi captivated the hearts of several women during his life time through the power of written words. Sahir fell in love several times and always wrote poems as a tribute to his love. Sahir remained a bachelor all his life. Sahir (meaning magician) as the name suggests he was truly a magician of words who spent over 30 years of his life associated with Bollywood, wrote over 680 songs for over 100 movies. It is said that while Sahir's heart was more concerned for others, he apparently never paid enough attention to his own life. He believed in the beauty of relations to him those who strike relations for life in his opinion were relations of a higher disposition. The journey of this legend is covered in the book spread across 14 chapters. One of the chapter’s in this book talks about an often repeated phrase spoken by Sahir Ludhianvi. While any discussions took place between Sahir and Hameed Akhtar directing towards Sahir’s future these words were most heard off, “Bada Songwriter Banoonga” (I will become a prominent songwriter). Sahir’s aplomb in these words were more attributed to his belief in his songwriting skills rather than keeping it restricted to just his dream. An interesting anecdote is seen in one of the chapters which speaks of “New Peaks, New Associations”. Sahir was known for his exalted ego and when his popularity was at its peak came his temperamental attitude which started rubbing people the wrong way witnessing his relations collapse with industry stalwarts like S. D. Burman as is also seen happening with many in real life for keeping their bloated ego. Once a film maker said in presence of Sahir and Lata Mangeshkar, “Sahib saab, agar Lata ki awaaz na ho toh aapke geet bejaan hai!” From that point onwards Sahir insisted that Lata would not sing any of his songs while taking up a film. On one hand no one could afford to ignore Lata Mangeshkar while on the other hand no one could even disregard Sahir. 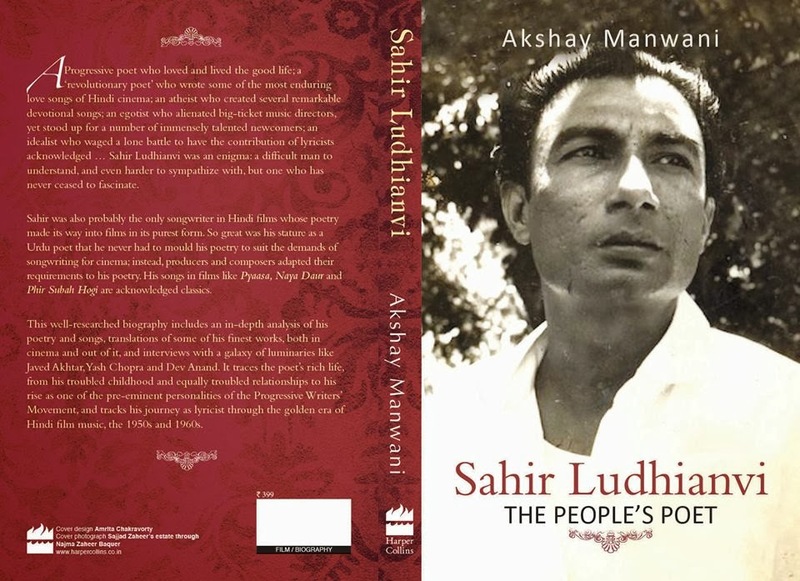 After reading the various defining moments in the life and times of Sahir Ludhianvi in this book one thing is evident that in spite of coming out of the woods of the broken heart Sahir never lingered with one issue for long. Having given the poetic form to the particular episode in his life he felt he had fulfilled his objective. Experience enriched his life so much that Sahir’s poetry was always filled with emotions reflecting his experiences or romantic associations. The chapter “Finding Love in the Shadow of Oedipus” speaks of this. The author has made detailed efforts to cover the “List of Film Songs”, “Select Bibliography” and “Index of Poems and Film Songs”. The biography is indeed motivating and sets the reader’s thinking that in spite of so much mental turmoil and bitter experiences in his personal life it did not make Sahir a bitter person. Rather, it transformed his mind to look beyond his personal life. His phrases were simple but always left a profound impact on the minds of the readers. To sum it up in his own words, “Jo mil gaya usi ko muqaddar samajh liya, Jo kho gaya main usko bhulaata chala gaya, Main zindagi ka saath nibhata chala gaya”.